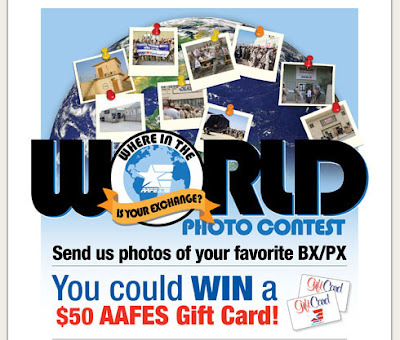 You can enter this contest online by sending a photograph of an Exchange with a 50 words or less description or story of the photo to PatriotFamily@aafes.com. Post the title “Where in the World is your Exchange” into the subject line. You must include your name, address, daytime phone number, rank or occupation plus photo information at the top left hand side of the email. Click here to view the contest rules and for more information.